A tribute to the golden rolling hills of the landscape I live in. A traditional grains motif in an all-over pattern that is simple as it is beautiful, and so easy to knit! Borders of garter stitch, soft scalloped edges at top and bottom, straight sides, and everything in between is from one simple Golden Fields chart. 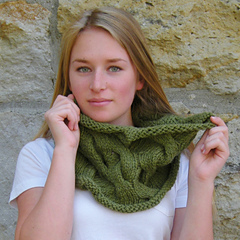 Pattern includes three styles: Stole, cowl, and square shawl with four sizes each style! Here Golden Fields is shown in stole. A few weeks back I did test-knit the cowl, and posted here . The cowl and stole will be really fun for me to knit over many times I think, especially with more samples of different Unspun yarns as I can come up with, as this one was knit with yarn I made and posted here. Pattern is now live on Ravelry HERE! Now please go check it out and get started on your Golden Fields, just in time for a truly wonderful gift to yourself or a very deserving loved one for the holidays & beyond! Abelene asked me if she could say something, so I will close with her note. It was a thrill to model Jen’s new lace design in my future house! A thrill I tell you! Jen carried me up a ladder to the second story under the rafters, and positioned me in a way where one only saw a small finished area in the house, but really there were tarps flapping and wind blowing through and it was so very cold but very very exciting! Besides, I was bundled up warm in Golden Fields stole, so feeling no goosebumps. In the photo below, Jen stepped back only about 6 feet, and you can see the mess and chaos of building, but it is coming along swiftly. Jen and I are both just over the moon. Emma on the new floor! Best thing I’ve seen all year, my Emma laying on her floor , and back home. 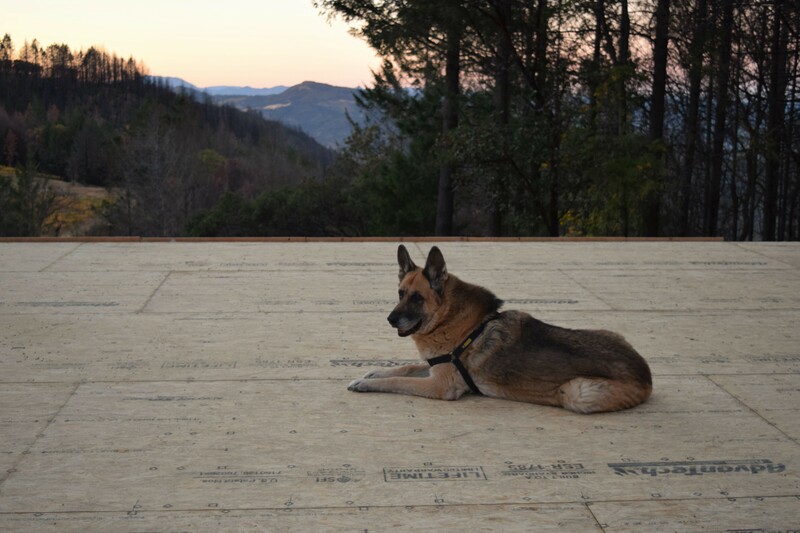 Now for a little catch up on the house construction! Do you recognize my signature view of the mountains? Foundation poured, and floor joists going up , photos just taken less than an hour ago, during the workers’ lunch break. Then a few hours later…. Watch this space, things are really happening now. Next week construction starting on the road (we’re forced to put in a road to rebuild!) and also starting next week will be the posts & beams of the timberframe going up! Emma is thirteen & a half today! Yesterday I took Emma out for a little walk, although not very far. I’ve been rather quiet about things going on with Emma, but now she is on the mend, I will mention that she seems to be slowly recovering from a serious illness which came on in the first days of September rendering her completely unable to move on her own, and with very little appetite. I thought I lost her and was enormously miserable for weeks as I nursed her , but now she’s able to walk a little on her own, getting stronger every day, and eating a lot! My constant companion Emma ~~ she’s such a soldier! Red lines painted for excavation & string elevations in place of where the rebuilt house will be. Yesterday took a turn for the worse for us. The previous Friday we were told we’d have our permit, and too soon did we think we could just start building. Our building permit got held up because of yet another detail some engineer at the county building department was chewing on ; we now have to change the plans to do more fiddling, as we have done several times already, until its become utterly impossible & ridiculous. This means more time to wait, and worst of all , more money to build, and it also means more debilitating frustration in our lives, but we are coping and won’t give up. Our county building administration is notoriously harsh and very difficult to get a building permit through on the best day, and don’t for a second think they are in any way being lenient to the many who have lost our homes to the wildfire, now 11 months later. Our contractors are ready to start, we have the batter boards & string line up for the foundation elevation, and had the foundation sub-contractor up here spraying lines in the dirt and scheduling a start as soon as permit is issued. Since its costing us more, we’ll end up having to do more of the building ourselves, and live in this teeny tiny space longer. Not really glad about things right now. I’ll let you know when things really start, as many of you have no doubt been wondering. I’ve just put this out there so family & friends will have an update ~~ apologies if I seem like a complainer, I’m just angry and at a breaking point. Back home, in the Charcoal Forest . . .
She is wearing just her sock now, and finally her inflatable collar & cone seem to be phasing out more because her old surgery wound which very mysteriously un-healed in the last six months, is beginning to heal again. I don’t know about you, but I really do think its stress related. Which brings me to mention we have moved back up to our Charcoal Forest! We are now living in a Tiny House which arrived April 30th, and what an unbelievable ordeal it was to get it up here !!! All I can say is that we three are exhausted and recovering from a load of stress, but ever so grateful that we are home. Since it is Emma’s birthday, I will give her a belly rub and a pat on the head from all of you! I had really meant to brush her up nice before her portrait shot, but did not happen, therefore the birthday girl is looking a bit scruffy & ungroomed. I thought in honor of her birthday I’d link to all Emma posts here. This rock I have seen in some places mounded up into nearly hill-sized formations which I suspect to be left behind by an ancient volcanic upheaval. Hard and a bit brittle, this broken shale is generally dark charcoal grey, although sometimes a medium grey. To achieve this color I use colors from the color-saturated neutral, blended with undyed wool shades of natural black and natural grey. And as natural black and brown fleeces are amazingly varied in breed and color, so can be this shale colorway, ranging from medium grey to almost black, just as the rock is. Began with Primary & Secondary Neutral recipe using approx 2.5g each of green, purple, and orange AND blue, red, and yellow, (or alternately 5g each of primary or secondary triad colors) blended thoroughly on blending board (see Blending For Tweed Simplified) ,lift batt, set aside. Layer 15g natural black with 15g natural grey, lift batt. Note: This blend is 50/50 black and grey. For darker color blend more black and less grey, and for lighter blend more grey, and less black. Layer color-saturated neutral batt with black/grey batt alternately. Lift batt, layer again. Layer once more for a more homogenized result, or go on to next step. Colorway blend: ” Shale” . Emma and I are pushing ourselves to complete the knitting trail, and it will be indeed a rapturous and celebratory finish! The equinox is in only two short days. I’m sure we’ll make it, we are already more than three-quarters the way done! Big Leaf Maples and Black Oaks are beginning to shed their leaves, and the acorns and fir cones are dropping too. In this rustic state of being the spicy Autumnal fragrance is faintly rising in the forest, and I am ready to crash into this season with transformative momentum, leaning into it with all of my weight, as I leave Summer’s oppressive heat, lazy days and restless nights behind me. All in all , things are incredibly quiet up here in the hermitage. Normally there are a frenzy of things going on, and posting becomes a rhythm of marking creative process, in the days striding out into weeks. Although lately, not so much, I wonder is this perhaps the calm in a storm? A year ago life seemed utterly bursting. Last year at this time I was immersed in a couple of exhaustive & major pattern-writing projects, helping Jeff get his old house ready to put on the market, rewriting several musical compositions at practice & playing gigs in the duo, still meeting my family often in Calistoga for visits while my nieces still were totally keen for photo shoots & sleepovers, new fleeting friendships bubbling up out of a mysterious internet abyss, and Emma and I were trekking the mountain ridge up to the precipice, together through the wild, and through the seasons. So much was going on in fact, that I couldn’t imagine how anything would possibly change, nor how quickly things shift, creativity cycles, relationships recede, nor how stifling those changes would feel. My corner reveals a feeling of quiet solitude that I must admit is not entirely relaxing…. nay, it is inwardly stressful. I am always fighting clutter as my nemesis, as it is a tribute to an indecisive and worrisome state of being, so surfaces are nearly stark naked by my best efforts, and yet I now long for gleeful active mess which abandons any idea of order. Just knitting the rows & rounds of two sweaters for nieces, for some future day well after the equinox, when I will pass them on and post another Sweater Success which marks the end of a job well done only to hop on to the next. But this time, I am actually not sure what is next. Emma is keeping watch over the woods so that there are no unsettling strange things able to lurk up from behind. She is doing much better moving about and we are walking together more, strengthening our weaknesses together. News is that Emma is on the mend from her surgery earlier this week. She got a bit of a tune-up at the vet while she was under anesthetic to remove a growth on her front leg, and before she woke up the vet did a quick dental, and trimmed her nails too. Five more days of antibiotics, nearly a week of the pain-reliever anti-inflammatory (which I may continue with, for her arthritis), and about ten more days of the annoying cone, then its back to normal. More news is that we are dealing with a bit of a mouse invasion and trying to get them ‘out’ is no easy task. Its on to the next big thing, casting on for Autumn Sweaters for my nieces, in the above balls of yarn is Berocco super-bulky yarn named “Peruvia Quick”. The light blue will be a Calidez Cardigan for Miss Seventeen, and dark blue a Calidez Pullover for Miss Fourteen. So that is that. 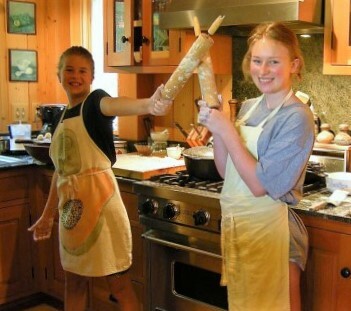 Amidst all the quiet commotion around here, Emma has turned twelve today! Her birthday present thus far has been a trip into town to visit Dr.Tracy (her favorite veterinarian) and got another blood panel test, which I’m sure will be as blue-ribbon results as a year ago. Tip top shape for a ‘tween’ German Shepherd with grey whiskers and a little arthritis, a good regimen of a lot of walks and naps! Well, just look at her here with her birthday presents from last year and the year before, Mr Raccoon and Mr Squirrel…. The three of them seem to be having some kind of discussion, which I fear to disturb for they seem to be reaching some kind of consensus. Meeting appears to be adjourned…. … its a go… they got it worked out, and now on to other things! Because Emma’s trip into town was an event to take in, and it being her twelfth birthday I let her ride up the mountain with all windows down! Oh the smells, pure heaven! I think she’s going to be fine for another birthday check-up next year. When Jeff returns from Peru (more on that later) we will have the celebratory ‘burger with hotdog candles cake’ with perhaps even another toy! Edit in 5pm closing time : Vet called to tell me that Emma’s bloodwork came back blue-ribbon beautiful again! We’re just so happy here, for our healthy t’ween-aged Emma. I’ve made a couple of monogrammed labels embroidered rather wonkily on pieces of old silk ties I collect. 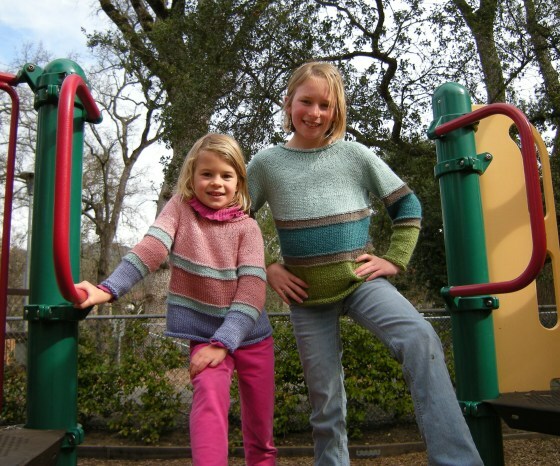 Next week is Spring break, and I am meeting my nieces in Calistoga, and will bring back gobs of spectacular photos of them modeling these Spring Sweaters I am sure. But for now, Emma and I are just hanging out. Everything in its place, and life is good. Emma & Me to you! Emma has gotten herself somehow mysteriously injured, and has been hobbling about for a day and a half. I suspect she may have slipped and fallen on the stairs while we were away at a neighbor’s for dinner on Saturday, because Sunday she just could not move hardly at all. Today she is a little better, at least been able to walk a little ways although very stiff and sore, far beyond her normal senior-dog arthritis. Emma sleeps in our bedroom upstairs, but in recent months she has been getting very unsure of herself on the stairs and has been needing help up and down because of the slippery hard-wood surface. Last weekend I cut up a big old rug for the turning area of the stairs, which helped a lot for that was where she was slipping the most, but the straight sections were still needing to be covered–insert Emma’s injury Saturday evening. So Sunday morning I went into town and I bought a smattering of small throw rugs, sewed them end-to-end to make runners, cut more rug matting, and created a patchwork of rugs on the whole stairway, which is now very cluttered, and a bit odd, but no longer slippery. I was so worried last night I slept on the couch downstairs next to her to give her moral support, and joy of joys, today she is much better and at least able to walk around a little outside but won’t be able to climb the stairs for a while yet. Wish her well, she’s looking up, and I’ll give her a good pet from all of you. Knitting Track News: I have measured with this wheel the feet distance of the whole knitting track. The actual ‘track’ is a sloppy figure-eight looping through woods very near our house, total of 1448 feet. Not a big deal, I know , but as the track itself is over 1/4 mile around, so three times around the track plus the walk to and from the track is 1 mile…. and folks, that is not nothing ! 5x is 1.5 miles, 7x is 2 miles, you get the idea. Just think of the knitting I can accomplish while working up a sweat! 144 finished feet done & dusted, about 1300 feet to go. I did about 60 feet just today, and I’m tired! For now it may seem perpetually under construction, but one day I will be finished and it will be a great accomplishment !! or all knitting trail & knitting-while-walking related posts HERE.